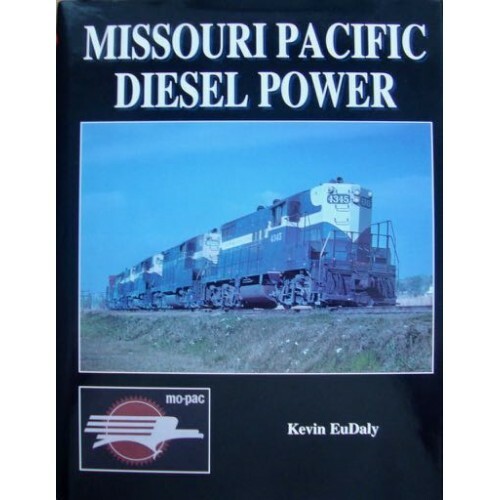 "Missouri Pacific Diesel Power is a chronicle of the history of the diesel on the Missouri Pacific, its predecessors, and subsidiaries. From the tiniest switcher purchased at the dawn of dieseldom, to the latter-day behemoths employed to move massive tonnage, the Missouri Pacific had a fascinating fleet of diesel power. Sleek EMD E-units, utilitarian Geeps, and Alco PAs whisked passengers and power from a variety of builders lugged freight across the MoPac system. Fs and geeps spelled the end of steam, and EMD standardization in turn replaced the early diesel fleet. The T&P and C&EI added interest to the roster as well, adding a number of models to the MoPac fold. The Alton and Southern added a splash of yellow. In the latter days of the MoPac fleet, large number of SD40-2s and GP38-2s powered nearly everything on MoPac rails. B-Boats and GP50s completed the fleet in blue. After being merged into the UP, the MoPac had two final locomotive purchases, SD50s and C36-7s that arrived from the builders in UP's yellow and gray. In time the MoPac name died, and lives now only as a part of history. The MoPac roster was a complex one, with numerous renumberings and strange locomotive transactions throughout this Midwestern road's lifetime. This book presents every diesel locomotive owned by the Missouri Pacific, T&P, C&EI, and other subsidiaries. Only a few tattered remnants still carry MoPac blue, a scheme new destined to be seen only in the halls of memory, and in the photographs now in existence. The MoPac flag has fallen.